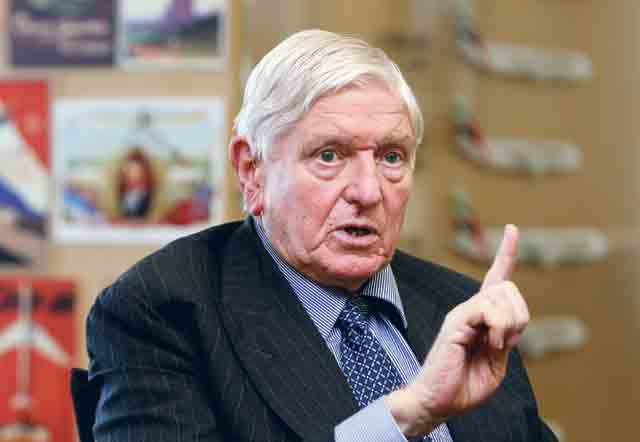 Dubai: Sir Maurice Flanagan, the founding CEO of Emirates and former executive vice-chairman of the airline, has died at the age of 86 on Thursday, his family told Gulf News. Born in 1928 in Leigh, Lancashire, Flanagan attended initially the now defunct Leigh Boys Grammar School, but transferred later to Lymm Grammar School, and then Liverpool University. In a statement, Emirates said: “The Emirates Group notes with great sadness the passing of our former Executive Vice Chairman, Sir Maurice Flanagan, KBE. A founding member of the Group, Flanagan passed away peacefully today at his home in London, surrounded by his family and loved ones. “He left British Airways in 1978 to become Director and General Manager of dnata, during the early days of Dubai’s economic development. In 1985, he led a 10-man team to launch Emirates airline with $10 million. The airline began operations on 25 October after hectic months of planning, and Mr Flanagan became Managing Director of Emirates. In 1990, Flanagan was appointed Group Managing Director of the Emirates Group. He became Vice Chairman and Group President in July 2003, and was appointed Executive Vice Chairman in 2006, a position he held until he retired in 2013.